It's just a reflex. I don't want people to fall, I feel bad, I hope they're not hurt, but despite all of my good intentions, I laugh. Once in college I remember seeing a kid fall off his skateboard trying to be Mr. Cool while passing a group of girls. I had to turn around and walk the other way (I'm not completely horrible, his friends were there to help him). Sometimes I even laugh when Carter takes a little spill. How bad is that? He'll teeter while holding onto his toy box, fall onto his little fluff bum and sometimes tip over. Even though I'm springing into action to catch him, when it's all over, I find myself trying to stifle a laugh. I think it's the wide eyes he gets when he realizes he's going down (coupled with the fact that I know he's not going to get hurt). Sometimes when I laugh, though, I think to myself how horrible of a mother can I be? I really hope I can get over these laughing fits by the time Carter is older. How nice would that be for him to be learning how to ride a bike, he tips over, and here comes dear mom to the rescue, laughing all the way? I think Tom would appreciate if I could get over it too. 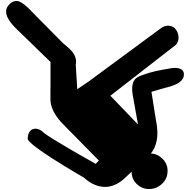 I don't only laugh at falling, but I have a weakness for little/non-serious injuries as well. Sometimes it gets me into trouble because it has gotten Tom kind of pissed on quite a few occasions. He'll just get Carter down for a nap, turn, stub his toe on the crib, cringe in pain, and I have to run out of the room covering my mouth with both hands. Sometimes a little giggle slips out, Carter hears it, flails, and we're back at square one. It's pretty bad, but I make up for it because I laugh at my own falls and injuries too. And I don't mind being laughed at when I fall because...it's just hilarious. It sounds like it's a nervous laugh! When someone tells me that there has been a death in the family, I nervously giggle and smile before I really comprehend it. You are not a bad mom! I think it lightens the situation a bit especially for the kids. They seem to be more calm when we don't react as much. My mom has always been the same way! She can't help but laugh when someone takes a spill and as I was an accident prone child she was sure laughing a lot. I can tell you from experience that Carter won't think twice about it! I knew that that was just the way my mother was and that she loved me and wanted to make sure I was okay, but that she just couldn't help herself. Ha!